Sweden is perhaps best known for ABBA, The Cardigans, IKEA, meatballs, and Volvos. But the word lagom has entered the British lexicon and is likely to become the epitome of 2017. Austerity and recession have yet to hit the British economy despite claims by the Remain camp that a vote to leave the EU would lead to economic ruin. But the British pound has crashed since the referendum resulting in a gradual increase in the cost of living. In December inflation rose to 1.6%, up from 1.2% in November and the highest rate since July 2014 [BBC]. And many manufacturers and suppliers are beginning to increase prices as the cost of imports increase. For those with fluidity and disposable income a rise in the price of fuel, Marmite and a plethora of products made by Unilever and Premier Foods will mean little [BBC]. But there is a certain 'clique' of society who, whilst not scraping a living, will be looking at ways to make cutbacks. And this is where Sweden is making an influence. Before Brexit the only Swedish words people might have known would be have been those associated with IKEA products. But in recent weeks there have been countless articles indoctrinating the British public into a very Swedish phenomenon, that of lagom. Lagom roughly translates as 'just enough' or 'not too little, not too much'. In Sweden it is said to be the philosophy of life. But it is creeping into the UK. Recently IKEA pushed out a sales pitch on the benefits of lagom entitled "Live Lagom" whilst a Daily Mirror article published last November reported that lagom helped one former student clear her overdraft. Danny Robbins play Cold Swedish Winter, which focuses on the Swedish way of life and lagom in particular, is being rerun on BBC Radio 4. Meanwhile the Daily Mail reported in its Femail section that lagom has the benefit of bringing happiness. Apparently the Brits all went a little bit Danish in 2016 — snuggling up in hand-knitted blankets, lighting pine-scented candles and sipping hot chocolate. "We were embracing the cosiness Danes call hygge", the Daily Mail declared. Hygge was, essentially, a lifestyle all about cosiness [BBC]. However some argued the phenomenon was more a conspiracy to sell everything from fluffy socks to cashmere cardigans, wine, wallpaper and vegan shepherd's pie [Guardian]. But whether or not hygge was ever in vogue in 2016 or a conspiracy to increase sales of fluffy socks, the buzzword for 2017 is most definitely lagom. Pronounced lar-gom it's one of the most frequently used words in Sweden — you'll eat a lagom amount of food, live in a lagom house and drive a lagom car. In other words, just good enough to enjoy life but not over-the-top or ostentatious [Evening Standard]. Swedes have taken this approach to life with a passion and little if any cynicism. But in a post-Brexit Britain embracing lagom could prove beneficial. It of course might be hard to swallow both for Remainers and Brexiters. Both might argue why one should be 'forced' to change one's lifestyle because of the EU referendum. But sadly facts are facts - unless one is living in Trump's post-truth world of 'alternative facts' [BBC / Guardian / Independent] and post-Brexit Britain is going to get more expensive. 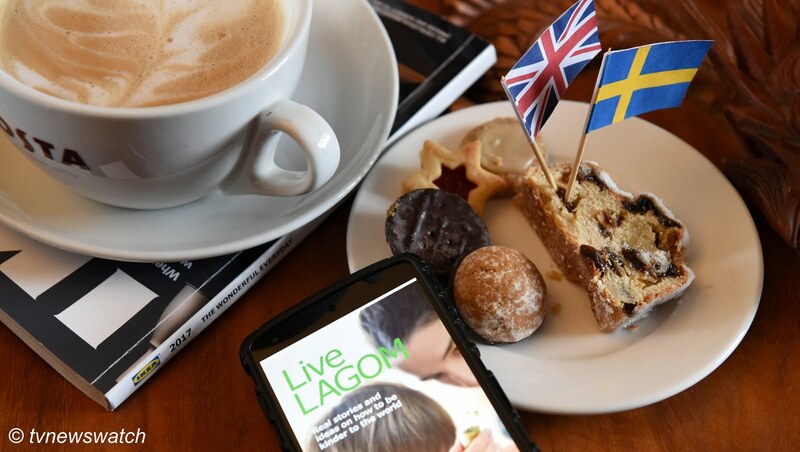 Apparently the Swedes are happier than us and much is put down to lagom [Huffington Post]. But can Brits embrace lagom? Whether Living Lagom can sweeten the taste of leaving the EU or merely soften the economic blow remains to be seen. Whilst you mull over these thoughts why not just relax and enjoy another Swedish concept, that of Fika - a coffee break where friends gather, drink coffee and eat cake. Fika is perhaps one instance where you can have your cake and eat it [Evening Standard].